property description: Laroche, once a small farm on the estate of an 18th century château, is surrounded by 5 acres of garden, woodland and meadows. Walk or cycle through a peaceful landscape of varied countryside of hill and valley, chestnut and oak woods and small farms. Nearby Brantôme has a beautiful riverside setting and many cafés and restaurants. Villars, the next village, has interesting caves and a Renaissance château. 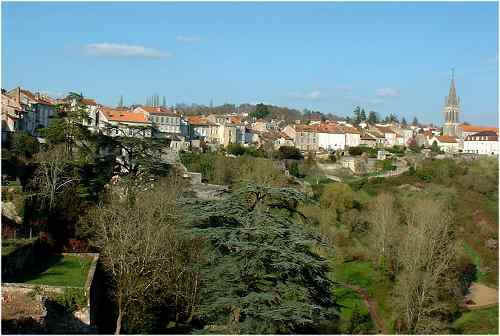 Périgueux, the Préfecture of the Dordogne, is 30 minutes drive away and has a finely restored and lively old town. There are tennis courts nearby and a swimming-pool in Champagnac de Belair. Enjoy lake swimming in the area and canoeing on the nearby river Dronne or further afield on the spectacular river Vézère. Nontron and Brantôme hold weekly markets and there is a village shop in Quinsac. When our ancesters roamed over Europe 30,000years ago they had excellent reasons for choosing to settle in the Dordogne region.Today you can visit the caves and shelters where they lived. There, your imagination will give you some idea of what it was like to be alive at that time. 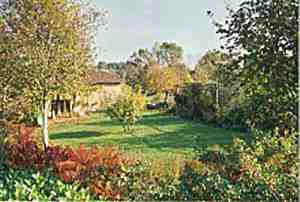 Périgord Vert is more peaceful than the southern areas of the Dordogne. Visit these easily on a day out and return to relax at Laroche! Relaxing on the terrace above the pool, shaded by vines or parasol, one feels in harmony with the beautiful landscape. Nearby are a boules piste, badminton net, table tennis table and of course, the animals - currently three donkeys, two goats and hens. The animals are great attraction for children, especially at feeding time! The cyling is wonderful around here, so whether you are a keen or an occasional cyclist, come and enjoy the ever changing landscape on good surfaces with little traffic. Outside are table and chairs beneath an old vine, and a table tennis table. In the shade of trees are another table, plenty of chairs and a barbeque. There is a selection of home-grown garden produce, honey and various home-made goodies for sale. The high ceilinged living and dining area is reached by a short flight of stairs from the guest entrance. On either side are the guest rooms; both have a shower / wc room. Bedroom 1 is 3m.x 5,70m. and has two single beds. Bedroom 2 is 4m.x 4m. and has a double and a single bed. A third bed for a child is possible in the double room. Both rooms have tea and coffee making facilities and the double room has a small fridge. 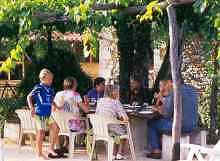 Whenever possible breakfast is served in the garden, at a large table shaded by an ancient vine. In the flower garden are chairs for guest house visitors. 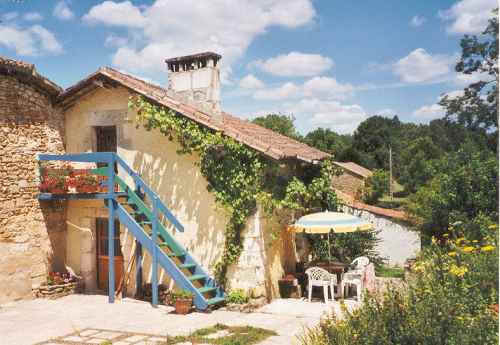 The gîte is let from Saturday to Saturday in the high season. 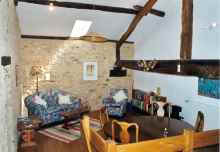 Out of main season, other lets can be arranged, including shorter stays and special prices for long lets. November - 26th March: prices by arrangement. Please confirm bookings by a deposit of 20%. Discount of 10% for 6 nights or more. If you live in the West Country, then the Plymouth- Roscoff crossing makes sense; a long drive on good clear roads in France avoids a trek along the south coast to Portsmouth. If you are doing the short crossing via the tunnel or ferry, check on what traffic is likely to be like, especially at weekends in July and August round Paris. Fly Flybe/Ryanair to Limoges or Bergerac, (both about 1hr 15minutes drive from Laroche) or even La Rochelle if you want time on the coast. Take your car on the train from Britain to Brive overnight. Brive is 100 km (60 miles) from Laroche. 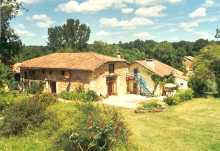 A family of five found it similar in price to flying to Limoges + car hire and the children thought it super!